We are kicking off our Father's Day with a drink. And a damn good one! I've never been a huge fan of bourbon (please don't tell my father because he would probably be disappointed in my Kentucky blood). After trying this drink, my fanhood has totally moved up a notch. Make that two. Prepare your glasses: rim your high ball glasses by dampening the rim. In a small dish, pour your vanilla sugar and a dash of cayenne. Give it a quick mix. Dip your glasses into the vanilla sugar/cayenne mixture. Fill your glass half way with crushed ice. 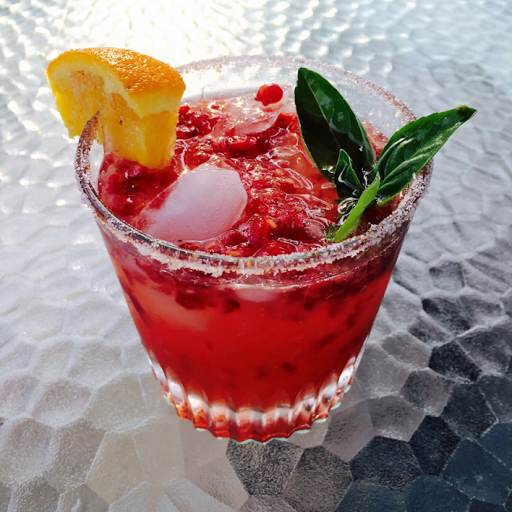 Mix the orange juice, simple syrup, bourbon, triple sec, and raspberries into a shaker with some ice. Give it a good shake. Divide into 3 glasses. Top with club soda and garnish with basil. Copper river salmon is finally in season! To celebrate, I tried something new. Grilling fish. Strait on the grill. Typically, my husband was always the grill master. I just didn't want to deal with the extreme 700 degrees of our grill, and quite frankly the grill can be intimidating. These days, I've had to overcome a lot of my fears, like giving birth, killing spiders, and manning the grill. Since my husband works fairly late, I try to have dinner ready when he gets home so that we can all eat as a family. Eating at 8pm, now, is no longer an option with a toddler. Amazingly, the grill is a lot easier than I always thought. Not to mention, less messy, less stinky, and AND....no more kitchen fires! The key is to have a really hot grill, flip once, and oil the grates. I use cooking spray--just stand back--those flames can really kick back. Now that we have overcome grilling, lets talk about this fish, shall we? Copper river salmon is in season only in the summer months. It's much more 'buttery' in flavor and texture. In fact, it's the real reason I love salmon today. Total fact. Up until 7 years ago, I did not like fish. Now, I don't know how I ever lived without it. What I love about this recipe is the crunch from the panko crumbs (japanese bread crumbs that are, well, pretty darn crunchy!). The finishing sauce, just brightens up the fish. And who doesn't like sauce? Leaving the skin on helps with breakage of the fish on the grill. Also, you don't even have to flip this thing, just cover with one of those disposable foil/aluminum pans over the top to create a steam cooking system. Oh, and did I mention this takes 25 minutes? Yup. Wisk Vinaigrette ingredients together. Set aside. For the fish: Mix together 2 T oil, and dijon and salt and pepper to taste. Brush over salmon filets. In a separate bowl: mix together panko, parsley, and 2 T olive oil. Top each filet with the mixture. Oil grill (be careful of the flames). Place salmon on the grill, skin side down. Cover with either a disposable aluminum pan, I used some aluminum pie pans I had. Cook 5-6 minutes. Or until fish is done. Check often for flare ups. ** If topping seems to be getting too burned and fish is still not done inside, you can put fish on a sided cookie sheet on a 400 degree oven for 5 minutes (or until done). I ended up having to do this. **tip: Once the fish is on the grill, leave it alone. Don't move it until it's finished. The skin will generally stick to the grill, don't worry about it, this helps get the fish off anyway. Also, use a metal spatula and quickly, but gently get under the fish to pull it off the grill. Serve over roasted asparagus and top with vinaigrette. Ok, so technically, I didn't make this. However, I did manage to put it together in just minutes for a little appetizer while I was making dinner. It's the perfect appetizer, its quick, simple and SO, SO good. I have had this many times before, but it finally became a staple on my Italian vacation with my husband. We would step into a small cafe while shopping and sight seeing, and take a little break with wine and a plate of prosciutto and melon. Every time I have it, it reminds me of our trip. The key here is using good olive oil, aged prosciutto (the best you can afford but the 18 month aged is REALLY good) and fresh, in season melon. We added a few marcona almonds for the side. Marcona almonds are actually a spanish nut. Oddly, they are grown in the worst soil conditions, but ironically grow these fabulous tasting almonds. Directions: Assemble on a plate, drizzle olive oil over the prosciutto. Salt the melon with fleur de sel if desired. Serve. Planning ahead can be really tough when you are busy. Sometimes I get caught up in all the other tasks of the week that I can't be bothered with sitting down to write a menu for the week, plus a shopping list that I will probably forget or lose at home anyway. This week, was just one of those weeks. I came off a busy weekend and I needed to just live with using what was in my refrigerator and pantry. I usually have chicken breast in the house, a few potatoes and an array of vegetables to chose from. Since my mushrooms were at risk of biting the dust soon if not used, I decided to make chicken marsala....something I haven't made in ages. What I liked about this was that it didn't dirty up a ton of my dishes, and I could do most of the work (pounding the chicken) while my daughter was sleeping. Then, all I had to do was dredge in a seasoned flour mixture and saute. Easy peasy. Serve with: mashed redskins, and hericot vert if you would like. Rinse chicken breasts, and pat dry. Beat with a mallot in between sheets of plastic wrap until chicken breasts are 1/4" thick. Mix flour, basil, salt and pepper together and spread on a large dish. Dredge each chicken breast in flour on both sides, shaking off the excess. Set aside. Preheat a large skillet. Add butter and oil. Once pan is hot and butter is melted, add the chicken breasts. Cook until chicken is brown on one side (about 3-4 minutes). Flip. Cook for about 2 minutes, add mushrooms. Cook for 2 minutes, then add marsala wine and stir mushrooms around. Cover and simmer on medium for about 8-10 minutes. Check on the chicken to see if it is done. Pour sauce and mushrooms over the top of chicken. Serve. After a very busy weekend of making the lady bug cake for my friends shower, I was asked to bring the birthday cake for my other friend Leslie to our women's wine tasting club. I was short on time and energy, but I still wanted my cake to be a show piece. Even though I need a bit of practice with the roses and piping, I think it turned out really cute. I stole the idea from my friend over at Dolce by Dana. I topped it off with some pink and gold disco dust. Another thing I need a bit of work on! I think it was enjoyed by all! The cake was my go to Valrhona chocolate cake, and was filled with a raspberry yolk-based meringue buttercream, then topped with vanilla swiss meringue buttercream. Two words describe this cake. Ok, that is four. But seriously, this cake is shout it from the street good! Last year, I made tres leches cupcakes that were not only dry, but sticky. A true disappointment since this cake should be extremely moist. This year, I went simple and went with a recipe from "The Joy of Cooking". There weren't a ton of ingredients and this took me about 10 minutes to put together. In my book...there is nothing more simple! Not only is this cake moist like a sponge when you bite into it, but it melts in your mouth! I know this cake traditionally has maraschino cherries on top, but truthfully, I don't like them. I put cinnamon on the top, instead. In fact, the first time I had this cake, 2 years ago at Forest Grill in Birmingham (February 20th to be exact) it also had cinnamon on top, and was so amazing, I went into labor. (I know...it wasn't the cake...just sheer coincidence, but it's something I will always remember as being 'my last meal'). This cake will definitely have to be on a rotation because to bust this cake out for only Cinco de Mayo would be too sinful. Now, GET OUT of here and make this cake! recipe derived from: "The Joy of Cooking"
Then-after beating, add 1/4 cup whole milk. Beat again until combined. Fold the dry ingredients with the egg yolk ingredients just until about combined. Then fold in the egg white mixture in 2 portions. Fold gently, just until the whites are mixed in. Pour batter in a greased 9x9 pan or 11x7 pan. Bake for about 25-30 minutes until a toothpick comes out clean and cake springs back. Mine took about 28 minutes. Let the cake cool for about 10 minutes in the pan. Poke holes in the cake about an inch apart with a toothpick. Pour 3-milk mixture over the top, leaving about 1/8th of a cup leftover (I did because it seemed to be soaked enough) making sure to get all the corners and sides. Cover pan with plastic wrap and put it in the refrigerator for an hour or overnight. Slice squares and plate. Top with Chantilly cream (recipe below) and sprinkle cinnamon on top, serve immediately after topping with cream. Whip cream until soft peaks, add confectioners' sugar. Mix again until combined. I made these cupcakes for my friend's shower this weekend in order to fill in the gaps of additional guests. At first, I chose cupcakes because, typically, they are relatively quick and easy. Of course, while researching "You Tube" for some decorating techniques for the cake, I found this cute little technique and decided, I had to try it! Fast forward to the day before the party, I was in full force cake decorating mode. I get my bag and tip together (a Wilton 124 tip) and discover I had a major problem. A left handers problem. Crap. Why didn't I think of this while I was at the cake store? Surely they were now closed. I was going to have to get handy with my right hand, or convince my husband to do it. I decided that me using my right hand to pipe the frosting was probably my best bet. By the second cupcake, I had carpal tunnel. (Seriously, my wrists are hurting from rolling out all the fondant from the cake). Then, the light bulb went off....I could use my left hand, I just had to work in the opposite direction. From then on, it was smooth sailing. What I love about these cupcakes is that they look like a flower! They are so cute and look great with the lady bugs. These cupcakes were a true hit with all the guests, especially the kids! I will surely use this technique again! I used my go to chocolate cake, and this vanilla buttercream. LISA:It's not just a name, its a Lifestyle! 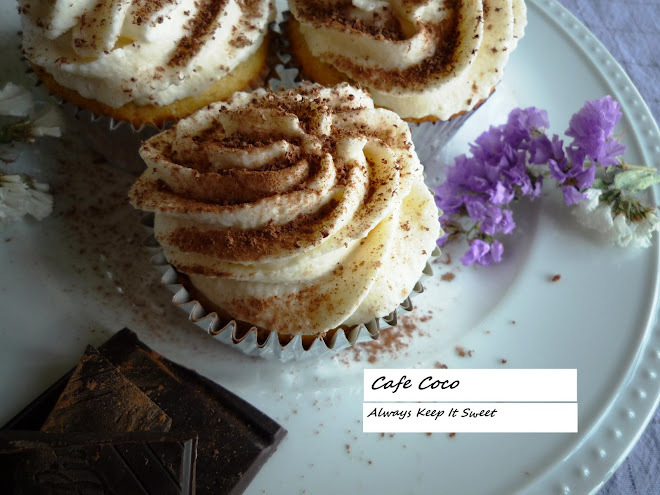 All content and photos on this blog are property of Cafe Coco Creations and are not to be copied. Watermark theme. Powered by Blogger.